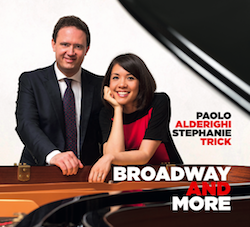 Broadway and More is Paolo and Stephanie's first album on two pianos, and presents original arrangements of Broadway shows from the '20s to '50s, as well as popular songs from Italy, England, and the US. Order Broadway and More from CD Baby now! 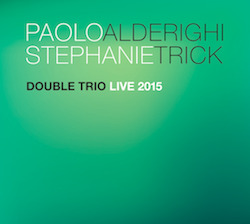 In Double Trio Always and Double Trio Live 2015, Paolo and Stephanie present their four-hands duo with a rhythm section. These albums feature Paolo and Stephanie's concept of the "Double Trio," where they play four-hands on one piano with the rhythm section, and also leave room for each other to play alone with the trio. Even if the latter formation can't be considered four-hands piano playing in the traditional sense, the two pianists decided to use this approach quite often because it produces a distinctive musical result, unlike that of the standard jazz piano trio with one pianist, mainly due to the continuous juxtaposition of two styles of improvisation. Order Double Trio Always from CD Baby. Studio recording with bassist Roberto Piccolo and drummer Nicola Stranieri. Order Double Trio Live 2015 from CD Baby. Live recording from a concert with bassist Marty Eggers and drummer Danny Coots. Sentimental Journey was recorded in Biella, Italy, and was released in June 2014. It is Paolo and Stephanie's second album together and features their own arrangements of swing standards, songs from the New Orleans repertoire, and an original boogie. Here is a review of this CD by Lynn René Bayley, which will appear in the November/December issue of the classical and jazz magazine, Fanfare. Order Sentimental Journey from CD Baby. Two for One was recorded in March 2012 in Biella, Italy, and released in July 2012. It features the repertoire of the Swing Era, with some blues and ragtime as well. Read a review of the album on JAZZ LIVES. Order Two for One from CD Baby. 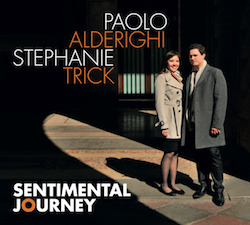 Paolo and Stephanie also have the CDs available for purchase at their solo and duo concerts.